Oliver Tailby was born in Gumley, Leicestershire, and was the son of Walter & Mary Tailby of East Farndon, Leicestershire2. In 1905, he married Dorothy Richardson (née Welbourn) of Grantham, a widow. By 1911, he was the manager of Eastmans the butchers at 69 High Road, Beeston where he and his wife and her children (from her first marriage to Joseph Richardson), lived over the shop3. Before his call up he was a popular figure on the High Road and was an active member of the Constitutional Club which was next to the Palace Cinema. 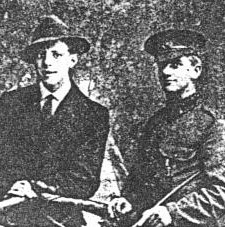 The photograph of Walter Gingle with Oliver Tailby in civilian clothes, was taken in August 1914. Oliver enlisted at Ilkeston, Derbyshire, and joined the 2nd/6th Battalion North Staffordshire Regiment. The 2nd/6th was formed at Burton in Derbyshire as a second line Territorial Battalion. In January 1915, it became part of the 176th Brigade 59th Division in the Luton area and, in April 1916, the Brigade sailed to Ireland where Corporal Tailby took part in the "Easter Rising", later transferring to the Curragh. In January 1917 the Battalion returned to England and, after training in the Fovant area of Salisbury Plain, landed at France on 25th February and the frontline trenches. Private Tailby was to survive until later that year when he was severely wounded . He was transferred from a Casualty Clearing Station to the No 8 General Hospital near Rouen where he succumbed to his wounds. He is buried in Boisguillaume Communal Cemetery Extension. The Constitutional Club, now the Conservative Club, moved to Acacia Walk when the High Road site (now Boots, etc) was redeveloped in the early 1960s and has recently moved to premises on Station Road, Beeston. Oliver Tailby’s name is recorded on the War Memorial there. Boisguillaume Communal Cemetery Extension - Boisguillaume is a district about 5 kilometres north-east of Rouen on the main road to Neufchatel. Locally, the Communal Cemetery is known as the Cimitere de la Mare des Champs. The extension adjoining Boisguillaume Communal Cemetery was begun in March 1917, most of the burials being made from No 8 General Hospital quartered at Boisguillaume in a large country house and grounds. A number of the graves in Rows A to G are doubles. There are now 360 First World War burials in the extension and one from the Second World War. 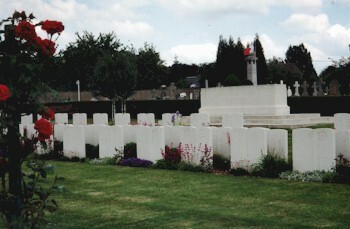 The communal cemetery contains a further 320 First World War graves4. 2This is the address shown in the CWGC records; for much of their lives, the family lived in Foxton, Leicestershire (see 1891 Census Piece 2491 Folio 90). 31911 Census : Piece 1223 RD429 SD3 ED1 Sched 164. The Eastmans shop was on the north side of the Hight Road, just to the east of Stoney Street. The children were Joseph Richardson (b. c1897) and Dorothy Richardson (b. c1898); Another child, Elizabeth Richardson, possibly a twin of Dorothy, was with her mother on the 1901 census (Piece 3055 Folio 83) but has not been located in 1911. Oliver's wife Dorothy is given as "Dora" Tailby, then of 21 High Rd, Beeston, in the CWGC record.